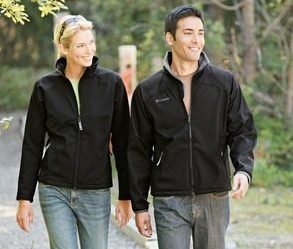 Warm Up to Soft Shell Jackets! What's warmer than a fleece and more breathable than a hard shell jacket? It's a soft shell! The soft shell concept was created to fill the void between the water and wind proofing of traditional hard shells and the comfort, flexibly and warmth of fleece. Soft shell outerwear is made of stretchy, woven polyester and spandex fabric which allows more air to escape, making it more breathable than hard shell gear. Soft shells are also water and wind resistant, making them ideal for all but the most extreme weather. With soft shell, it's easy to look put-together and chic while staying warm and dry. With style that's both classic and current, the Metropolitan pairs easily with business attire or with jeans. 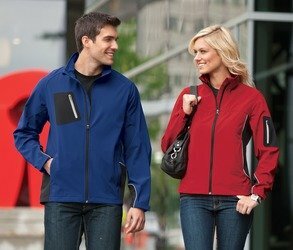 Metropolitan Soft Shell Jacket "
Ladies Metropolitan Soft Shell Jacket "
This sporty jacket is stretchy, breathable and equipped with attention-grabbing extras like colorblocking, welded pockets and reflective trim details. Quantum Soft Shell Jacket "
Ladies Quantum Soft Shell Jacket "
From one of the foremost names in outdoor apparel, these jackets are just right for trekking inside or outside the city limits. Shelby's Soft Shell Jacket "
Ladies Valencia Peak Soft Shell Jacket "